Arco Vecchio is a synonym for what living in the Old World feels like. In the centre of Rovinj, overlooking beautiful old cobbled street Garzotto in Rovinj and its galleries and art ateliers, a comfortable one bedroom apartment in an old Venetian stone house - a perfect way to experience the real Old Town Rovinj! It is a cozy dove for all admirers of history, culture and art, just a step away from Rovinj cafe's, restaurants, main square and the beach..
-OWNED BY CERTIFIED CROATIAN TOURIST GUIDE - my assistance is available constantly throughout your stay! 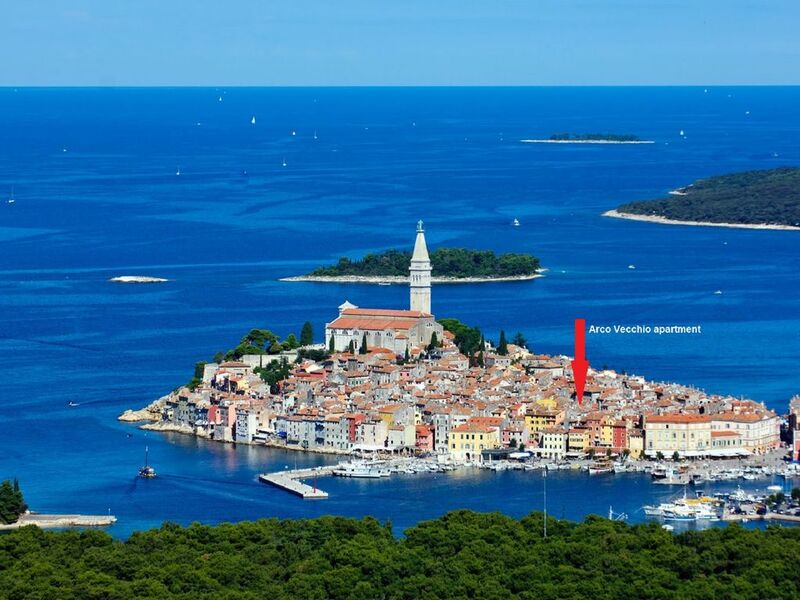 I am Croatian from Rovinj, who enjoys travelling, culture, historical buildings and reading, and I am inspired by Rovinj Old Town where my apartments Arco Vecchio and sea view apartment Casa Bella are situated. My father Zelko is a great help in assisting our guests at the apartments and providing local, out of guide tips, so you can really discover this gem. I currently live in Porec where I work as a hotel general manager, and I really enjoy the hospitality sector and meeting so many great and inspiring people. It took me a long time to choose my two favorite spots in Rovinj with such a unique location, the lovely view and a good vibe, so today I am glad to be able to offer my two homes to travelers from all over the world who want to feel the real spirit of the Old Rovinj, being in the heart of it all. If you like art, history, cobbled streets, hidden gems and lovely food, this is a place to stay! Enjoy. Amazing hosts in an amazing city in the a great location! I will be back!!! Thank you! The hosts, Zlolkjo and Zlolkja (father and daughter) are so kind, warm and welcoming. Zlolkjo was there to meet me and direct me to the parking which is arranged in advance! This is very helpful and much more cost effective in Rovinj. He then helped me with my bags as we strolled 10 minutes through the old town and to the beautiful home. The apartment truly feels like a home. Two nights was nowhere near enough time to see Rovinj, Istria or to stay in this beautiful Croatian home. I highly recommend and I will be back for sure. Thank you so much! Great location. Owners very welcoming and informative. Helped with discounted parking and helpful suggestions for restaurants, beach excursions, etc. Washing machine a big plus. Arco Vecchio was located in a great position in the old town. The apartment had everything we needed, and we particularly loved the comfortable bed and pillows... luxury! Our host Zeljka was brilliant, and a great communicator. She also sent us a suggested itinerary for our five day stay in Istria. The hosts dad Zeljko met us on the first day and was incredibly helpful with our luggage and advice on where to visit, restaurants etc. On check out he also met us and arranged for transport for our luggage to our car. What a lovely gentleman he was! There is no parking available in the old town but the host arranged parking within walking distance nearby. The apartment was clean, spacious, well-equipped and centrally located. We had a great time staying here and we could not have found more helpful gracious hosts. Wonderful people. They really went above and beyond. I would highly recommend this place. Try the fresh fish and swim in the rock swimming holes along the Adriatic. Very special. We had an amazing time in Ravijnn. Would go back tomorrow if we could. The apartment was perfect and so is the location. The owners are very gracious and the best hosts. We highly recommend this apartment. We were greeted on arrival by the owner's father. He showed us around the historic town of Rovinj and picked up wine and chocolates for us along the way. The apartment is simple but comfortable and plans are in the works for further upgrades this winter. Restaurants, swimming and everything you need are steps away in this maze of pedestrian-only cobbled streets. We felt so well cared for!